LG has hit the ground sprinting when it come to smartwatches. One of the first out the door with the original G Watch, followed by the G Watch R, and the Watch Urbane this spring. Now, they’ve got yet another smartwatch to sell—and this one is an Android Wear first. The LG Watch Urban Second Edition, let’s just call it “new,” comes with LTE, much like the original Urbane’s South Korea equivalent. However, unlike that first Urbane that used LG’s own WebOS software, the new Urbane uses Android Wear, which is probably the wearable OS you actually want to use. The shtick? The Android Wear watch is equipped with LTE, meaning it has its own SIM–and, yes, its own phone number. LG says it’s working with carriers to make to numbers as seamless as possible. It also houses one of the biggest batteries in a smartwatch yet, at 570mAh. One problem: It’s massive. When I wrote about Huawei’s new smartwatch, I felt like 11.3mm still edged on just a little to clunky. Well, LG is turning it up to eleven with a watch that’s 14mm thick. A lot of that size is coming from the battery compartment, as well as the removable cap under the watch case so you can slip in a SIM. The result is just one, huge, giant smartwatch. 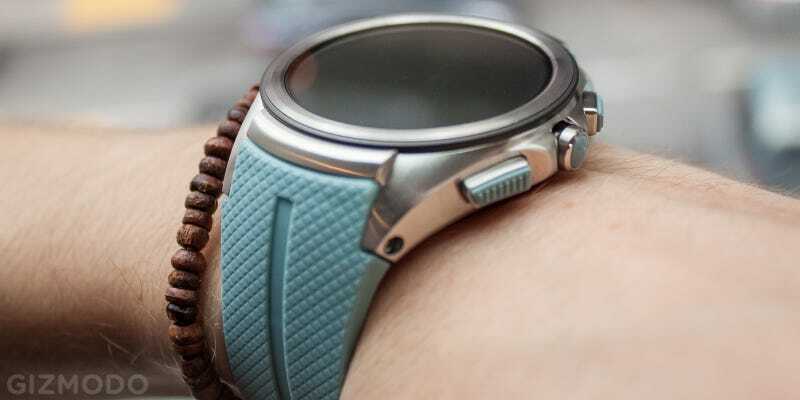 LG rolls with the idea, clearly embracing that G-Shock-type fashion accessory, much like it did with the G Watch R. The watch case is silver and four separate bands are available: black, white, coral (greenish-blue), and brown leather. The first three colors actually match the same color palette as the new LG V10 smartphone. Another neat little addition is making the three hardware buttons on the side–which quick launch LG Health, Home screen, or calls your favorite contact–match whatever band you buy, much like the digital crown on the Apple Watch. Unfortunately, I was unable to actually try out the calling feature since LG’s still working with pre-software, so we’ll have to see how great (or awkward) it is to talk to your wrist. But with the increased 570mAh battery, LG says one-day battery life is no problem–and depending on use, you could even squeak out two if needed. That’s cool, but on my (ok, I’ll admit it) dainty wrists, it’s just way too massive, though integrating LTE in Android Wear is exciting. Next, let’s focus on packing it into something just a little more wearable.